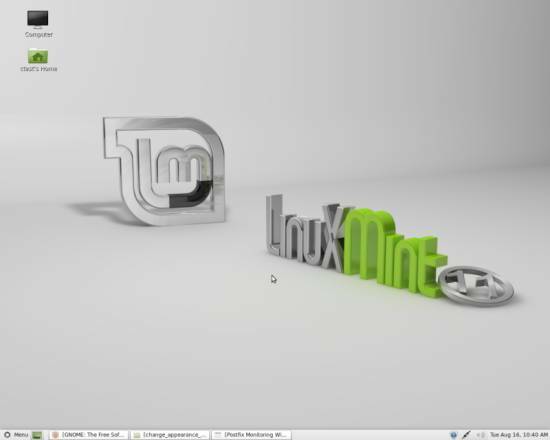 This tutorial is supposed to show you how to change the GNOME desktop’s appearance on Linux Mint further than the standard options of the Appearance section in the Control Center allow. I am going to use several different applications for this cause. 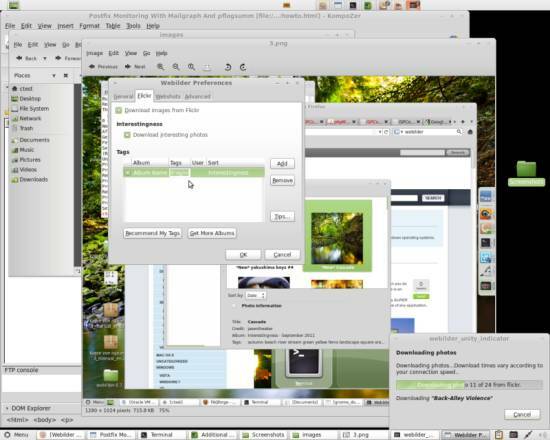 This tutorial will describe how to alter the appearance of a Linux Mint 11 system with a GNOME desktop. 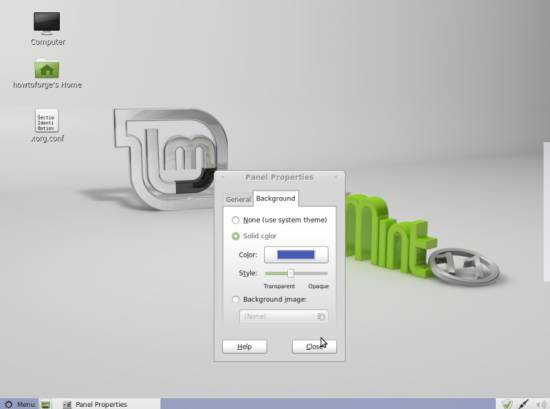 This is the standard desktop that comes with Mint, so if you have not changed anything about that all steps should work fine for you. Be aware that the use of the nVidia proprietary drivers may not be unrisky! This tutorial comes without warranty of any kind! 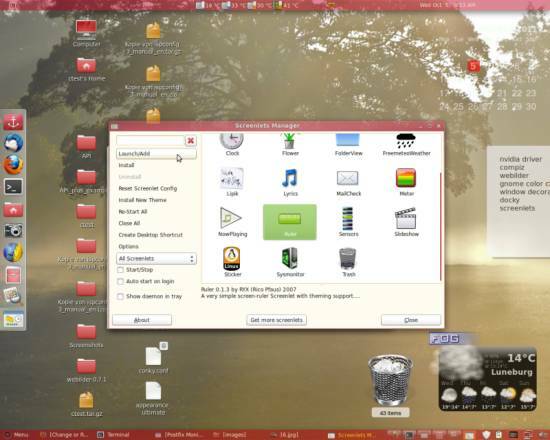 Of course you can choose which of those options you would like to apply to your desktop, however Compiz Fusion, Docky and lowering the window decorations’ opacity need the nVidia proprietary drivers to be installed. At this point I want to note that you should only try to install the nVidia proprietary drivers after you have backed up your system and no data would be lost if you had to reinstall Linux Mint. It may easily occur that the nVidia drivers are installed incorrectly, especially if you had other drivers installed manually in the past. Also, make sure that you have an installation medium of your present OS (which should be Linux Mint 11) in case there is no other way but to reinstall it. If your machine reboots properly after the drivers’ installation, proceed by installing Compiz Config and skip the rest of this chapter. Save the file and reboot afterwards. Your system should then be booted using the vesa drivers which should be enough to either remove, or try to install the nvidia drivers again. If you choose the latter, make sure that the Driver line of your xorg.conf says nvidia instead of vesa. Webilder is a tool that automatically downloads images from flickr and/or webshots, sorts them in categories and rotates your wallpaper every once in a specified interval, using the wallpapers it has downloaded. You are also free to set tags for downloading, delete downloaded images and rotate the wallpaper manually. 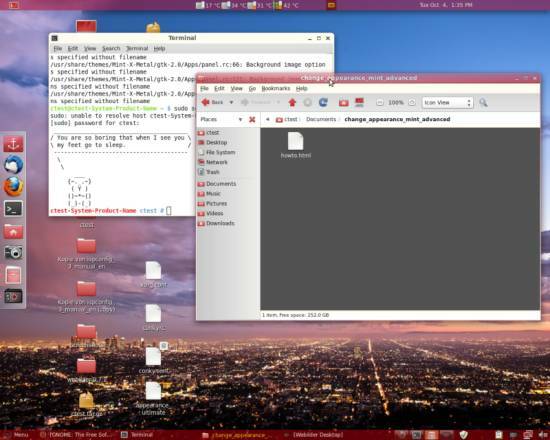 It is also the tool used to rotate wallpapers in the Ubuntu derivative Pinguy OS. If not started automatically, rightclick your desktop panel and select Add to Panel…. Browse the available applets and click on the Webilder Desktop Applet. Click on Add and the applet should appear on your desktop panel. If the applet was not available in the list of applets in the first place just restart your system and it should appear in the list. Leftclicking on the camera icon on the panel will give you the important menu points to deal with Webilder. To start with, select Preferences. 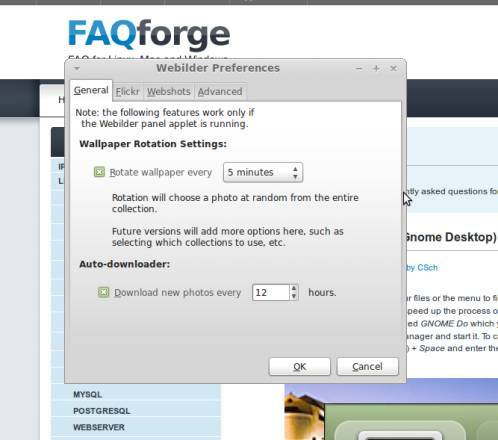 Here you can specify the intervals of rotation and download of wallpapers, which wallpapers should be downloaded and where they should be downoaded from. To add filters, head to the flickr tab, use the Add button and click on the filter fields to configure it. 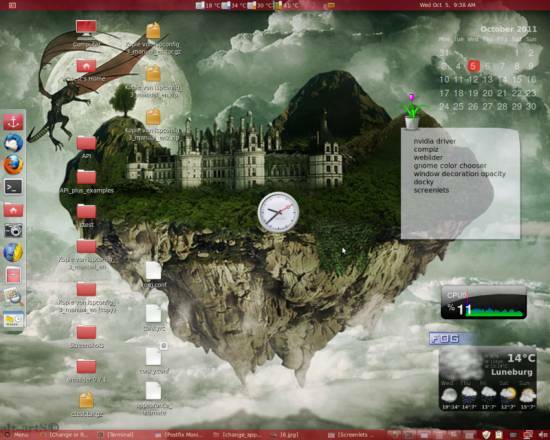 With this tool you have the option to apply the looks of your windows, menus, desktop icons, buttons and everything to the way you would like your desktop to look like. 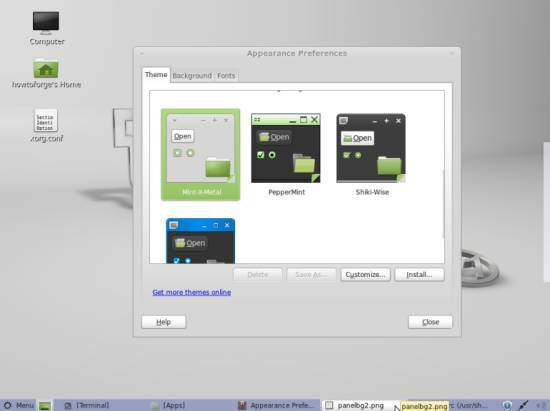 Simply run it through the Mint Menu, configure some colors, enable them, and click on Apply to see what they look like. Docky is an Apple-like dock that is placable on any of the screens borders where you can put applications and folders onto to quick-access them. Remember that you need the nVidia proprietary drivers to do this! On first startup there is not much placed in the dock, however there is a Docky icon with an anchor on it, which you can rightclick to configure it. To add new items to the dock, just drag and drop them onto it! 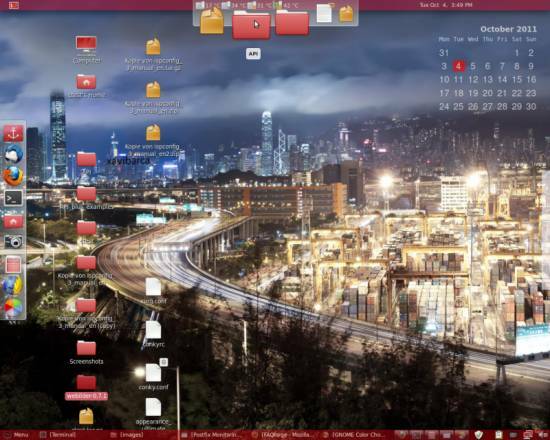 Screenlets are small visual applications comparable to widgets that you can place on your desktop to fulfill a certain function such as displaying time, processor load, calendar or the weather. into a terminal logged in as root. On startup you will be shown a window with a selection of already preinstalled screenlets that you can instantly launch, however you also have the option to download new screenlets from the appropriate websites. To add screenlets to your desktop, doubleclick them or select them and hit the Launch/Add button on the left. Then drag the screenlet to the location you want it to have. There you are free to Lock it by rightclicking and browsing the Window category. To install new screenlets, download the packed files from a website (such as the GNOME screenlet website) and click Install or Install New Theme to browse your files for the downloaded package. 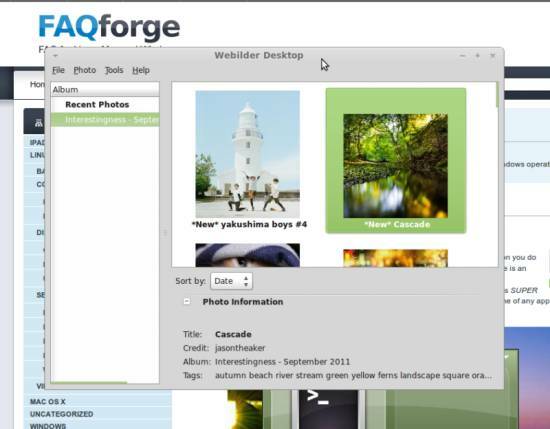 The default preferences of the control panel in the bottom of the screen allow you to either use a picture as its background image or to choose a color for it and lower its opacity if you use that action (access those by rightclicking free space on the panel and choosing Properties). If you color the panel however, not all elements of it will be colored but only the background, leaving all the buttons and backgrounds of panel icons grey. Although it has become more pleasing to the eye, there are still some annoying grey areas left if you use the Mint-X(-Metal) theme, while the others will look nice now. These areas originate from the imagefiles of the buttons, which are not completely transparent. 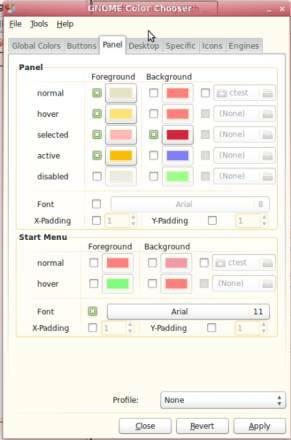 The two options that you have if you still want to use one of these themes is to either disable the graphical buttons at all or to edit their borders to be completely transparent. To disable the imagefiles of the buttons and display the tabs solely with their name and the application’s icon, open the panel.rc file from before again and search the style sections for all values including Apps/Panel/button. Like before, comment the entire lines out by placing a # in front of them. 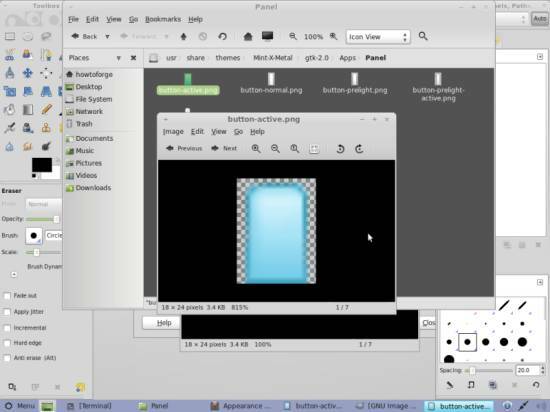 To make the borders of the button graphics transparent you will need to edit them manually with a graphical editor like The Gimp. 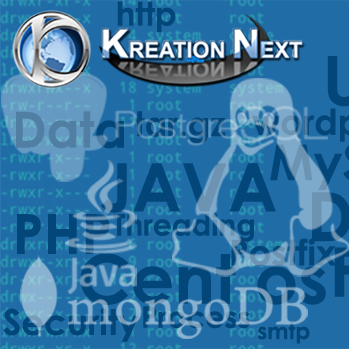 The files are located in /usr/share/themes/Mint-X-Metal/gtk-2.0/Apps/Panel. Open them as administrator by rightclicking and choosing the appropriate action, then open them with an editor with the help of the control bar. Erase the colored transparent areas arount the actual buttons and save the files (The checkered area is the “table” beneath the image itself – it is only visible through transparent areas. You have to remove all color from the areas where this table shines through). Then switch to another theme in the Control Center and back afterwards to use the updated theme. Your panel buttons should then either have their border removed or vanished completely, depending on which option you took. By using this option you achieve something that looks quite like the glassy look of window decorations that Microsoft Windows uses since its Vista Version. Remember that you need the nVidia proprietary drivers to do this! 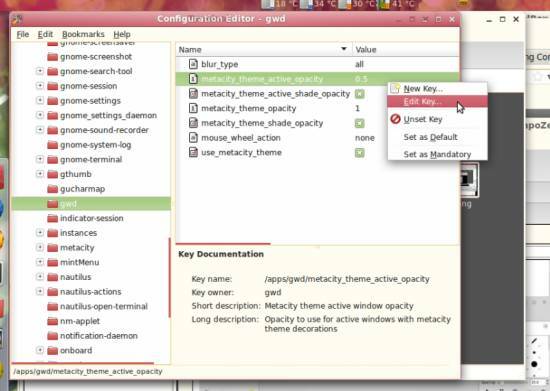 A graphical user interface will appear that helps you to modify all kinds of keys. The ones you are searching for is under Apps > gwd. metacity_theme_active_opacity is the value for the currently active window, while metacity_theme_opacity is the value for all windows running in the background. Rightclick the keys and choose Edit Key… to change their values. You can select a number between 0 and 1, where 1 is full opacity and 0 is highly transparent.